Like everyone expected, WBC heavyweight Deontay “Bronze Bomber” Wilder (39-0, 38 KOs) made easy work of #1 WBC mandatory challenger Bermane Stiverne (25-3-1, 21 KOs) in stopping him in the 1st round on Saturday night in front of a big crowd of boxing fans at the Barclays Center in Brooklyn, New York. The fight was televised by Showtime Championship Boxing. Before Wilder was through, he had knocked Stiverne down 3 times in the 1st round. Referee Arthur Mercante Jr. stopped the fight after the third knockdown of the round. You can argue that he probably should have stopped the contest after the 1st knockdown, as Stiverne never recovered from that one. Wilder knocked Stiverne flat with a right hand straight down the middle that split the guard. Stiverne got up but he was in a bad way. Stiverne didn’t land one punch in the fight. That’s the sad part. It was all Wilder. Stiverne couldn’t land anything, because he looked too afraid to throw any punches. Wilder looked angry after knocking Stiverne down. Wilder stood with his arms down by his sides and dared Stiverne to come forward. Wilder then knocked Stiverne down with a windmill right hand to the head. 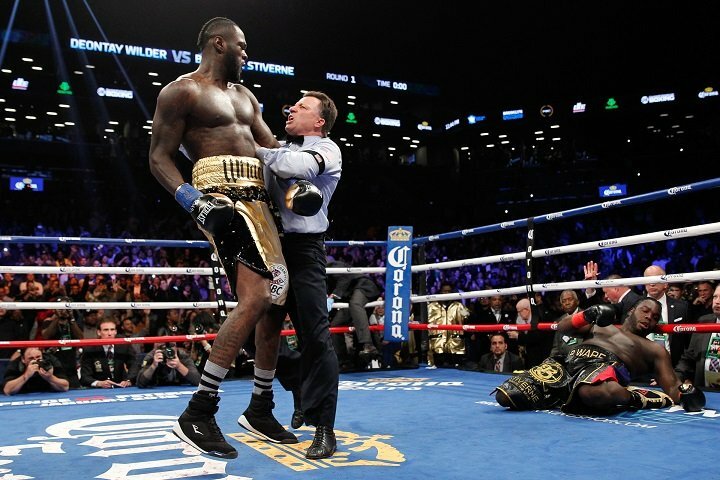 The punching form from Wilder wasn’t great, but he did the job in getting Stiverne down for a second time. After Stiverne got up, Wilder went after him with a 3-punch combination that put Stiverne down for the third and final time in the round. The finishing punch was a left to the head from Wilder. For Wilder, this was the second time he’s beaten Stiverne. He defeated him 2 years ago in January 2015 in beating him by a 12 round unanimous decision. The World Boxing Council ranked Stiverne at No.1 despite him being inactive since 2015. It wasn’t fair to Wilder that Stiverne was ranked so highly without him not having fought for so long. Stiverne made his problems even worse by coming into the fight so heavy and out of shape. The fight was stopped at 2:59 of round 1. Stiverne didn’t look like he was ready to take on a fighter like Wilder. Up until 2 weeks ago, Stiverne was scheduled to fight Dominic Breazeale on Wilder’s undercard. Wilder was supposed to fight Luis Ortiz, but he tested positive for a banned drug and he couldn’t take the fight. As bad as Stiverne looked tonight, he would have lost to Breazeale as well. In other action on the card, undefeated light welterweight Sergey Lipinets (13-0, 10 KOs) defeated Akihiro Kondo (29-7-1, 16 KOs) by a 12 round unanimous decision to win the vacant IBF light welterweight title. The judges scored it 118-110, 117-111 and 117-111. Lipinets and Kondo took turns landing big shots for 12 rounds. Lipinets had the superior power, so he was able to win the decision. It wasn’t impressive stuff though from Lipinets. The way he looked tonight, he’s going to have a hard time holding onto his belt. Former welterweight title holder Shawn Porter (28-2-1, 17 KOs) defeated Adrian Granados (18-6-2, 12 KOs) by a 12 round unanimous decision to win the vacant WBC Silver welterweight title. The judges scored the fight 117-111, 117-111 and 117-111. This was more of a stay busy fight for Porter than one that was meant to be competitive. Granados didn’t have the punching power or the size to stand up to Porter and win. The guys that will give Porter problems are Keith Thurman, Errol Spence, Danny Garcia and Terence Crawford at welterweight. Former heavyweight world title challenger Dominic Breazeale (19-1, 17 KOs) defeated Eric Molina (26-5, 19 KOs) by an 8th round knockout off TV results on the card. Molina took a knee in round 8 to escape punishment. The fight was stopped after that by Molina’s corner. Next boxing news: Is Deontay Wilder the best Heayweight in the world?